Let me ask you two simple questions? 1. Are you a Klingon? 2. 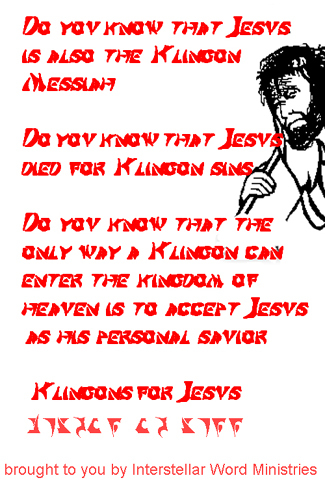 Are you aware that Jesus is the Klingon Messiah? You may be thinking to yourself, "Me worship Jesus? But I'm a Klingon!" Not only should Klingons worship Jesus but Jesus is the messiah the Klingons have been waiting for all along. Well Jesus was tortured for days and days on the cross and we at Klingons for Jesus encourage you to look at pictures of it. Do you like war and conquest? 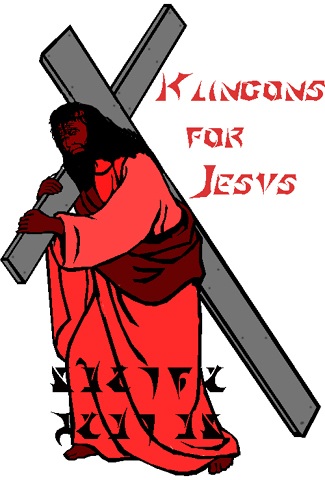 Jesus' followers conquered most of the known world, enslaving and colonizing it country by country and forcing its inhabitants to worship Jesus and we here at Klingons for Jesus are carrying on his mission. Do you like killing people? Jesus' followers have massacred hundreds of millions of people throughout history! Christians are the biggest killers in the universe. As a Christian you'll be able to go on crusades and murder millions for no other reason than that their religion or their version of Christianity is different than yours. Now doesn't that sound like fun? Do you like killing Gods? We know Klingons killed their Gods and we Christians also killed our God and we feel really bad about it. As a Christian you'll be encouraged to rexperience killing God frequently as well as fantasize about drinking his blood and eating his flesh. Do you like forcing people to obey you? As Christians we believe that it is our mission to force the entire universe to worship as we do and it is our duty to force, bribe or trick them into doing so! And so we have launched a mission to convert the entire universe to Christianity. It's a big job but we have a lot of pamphlets and sooner or later you will join us too. For more information please browse our pamphlet below. There are some who say that we should respect the beliefs of other races and cultures. We say that the greatest form of love we could show them is to destroy their beliefs and culture and replace it with our own. Come join us, as one of our "Trophy Klingons," we will display you as proof of our superiority while sneering at you and sending you off to convince other Klingons to join us as well. It is Jesus, alive and free. it is Jesus , have no fears. Won't you come on down to the nebula where the gases wash you clean? Wont you come down to the nebula where the righteous shall be seen. for the lost and the sinner, to let Jesus light your way. Klingons for Jesus.. they come and they go..
Klingons for Jesus for those in the know..
Klingons for Jesus oh what can I say.. I want to be Klingon for only a day. come and hear your messiahs words!